Daniel Vela, Board of Trustees member, speaks Monday as the McAllen School Board voted on a facilities master plan that includes several changes, such as the relocation of Achieve Early College High School and Navarro Elementary School students at a meeting at the McAllen High School auditorium in McAllen. McALLEN — After months of weighing options and determining how to address facilities’ needs, the McAllen school district board of trustees voted to approve a master plan Monday evening that includes repurposing campuses and relocating students and staff as early as the 2018-19 school year. During a regular board meeting Monday evening, the board of trustees approved the plan in a 5-2 vote, which includes relocating students from the Achieve Early College campus — which is mainly composed of portable buildings adjacent to South Texas College — to Lincoln Middle School a few blocks away. The board and Superintendent Jose Gonzalez clarified from the start, as they did in workshop meetings, that teachers and staff will relocate along with the students, with no plans to eliminate any of those positions. Lincoln Middle School students would in turn be moved to other middle schools, including De Leon, for those living in the area flanked by Bentsen Road and Business 83, and Whitewing Avenue and 23rd Street; Travis for those living in the area flanked by Business 83 and Bentsen Road, and 23rd Street and Expressway 83; and Fossum for those living in the area surrounded by Dove Avenue and Bentsen Road, and Whitewing and Ware Road. Another change includes moving students and staff from Navarro Elementary School to vacant space at the Seguin and Wilson elementary campuses. Navarro Elementary will then be repurposed to house the district’s Head Start program and special education department, Gonzalez said during the discussion. These two changes and others — including a new tuition-based pre-K program announced earlier Monday, as well as having the Milam and Gonzalez Elementary campuses become closed-enrollment, meaning these will only take in students living in the assigned zones — would become effective during the 2018-19 school year. “That would prevent us from having to rezone those particular campuses,” Gonzalez explained, adding that current transfer students attending Milam and Gonzalez who don’t live in the area can remain at the campuses until they finish the last grade level there. Additional changes for the 2019-20 school year were also included in the master plan, which includes similar repurposing of Bonham Elementary and rezoning of district lines to move these students to Escandon, Houston and Roosevelt. Zones feeding into McAllen High School would also change to take some Fossum students to Rowe instead. The plan approved was described by Gonzalez as a living document, which can be modified if any of the campuses’ enrollment was to change before it undergoes the transition. This opportunity for change would mainly apply to 2019-20 plans as the 2018-19 changes would be budgeted and begin the notification and implementation phase before the end of the current school year. The option of further discussing these changes with the community via town hall meetings and other resources was brought up by trustee Debbie Aliseda, who was one of only two trustees who voted against the masterplan. Aliseda stated that while she agreed with the need to repurpose campuses and make these type of changes, there should be more input from local stakeholders. This notion was applauded by those in the audience, which mainly included parents, teachers and staff sporting shirts with the Navarro Elementary and Lincoln Middle School logos. But district officials said waiting on a vote would mean falling behind on budgeting for the 2018-19 changes, as well as delaying the time needed to notify families, teachers and staff of any relocations. 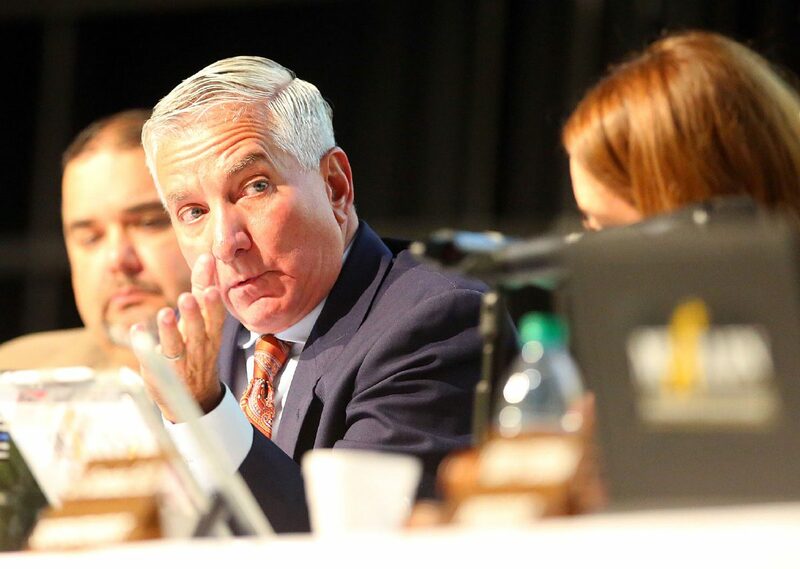 After the vote in favor of the measure, teachers and staff were visibly shaken, some left the McAllen High School auditorium, where the meeting took place, nearly in tears. None of those approached for comment agreed to go on the record, but the emotions were clear as they shook their heads in disappointment and dabbed tears from under their eyes. Other concerns from parents included transportation. Even though they were assured by the superintendent that transportation would be provided by the district, parents said they don’t trust that this won’t change after the initial year. Treviño said parents and other stakeholders would appreciate the district conducting meetings to address some of these concerns now that they have already voted. The parents collected signatures from more than 100 concerned parents, which he said will be taken to administrators today. This story was updated to reflect that Alfonso Treviño is the parent of a Lincoln Middle School student and president of the campus Parent-Teacher Organization.